Bottom graph shows temperature reconstruction over the past 563 years. 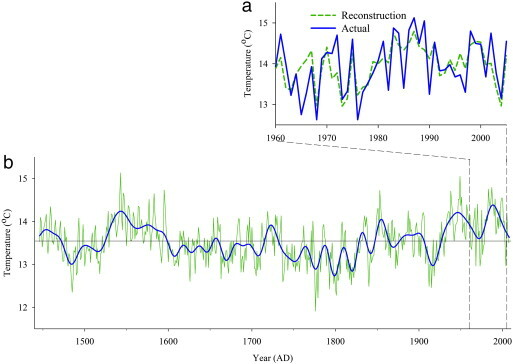 Note the Medieval Warming Period was ~1000 years ago and is not shown in this reconstruction. Top graph shows reconstructed temperatures compared to actual observed temperatures. We developed a tree-ring chronology (AD 1446–2008) based on 75 cores from 37 Abies squamata Mast. trees from the Shaluli Mountains, southeastern Tibet Plateau, China, using signal-free methods, which are ideally suited to remove or reduce the distortion introduced during traditional standardization. This chronology correlates best with regional temperatures in June–July, which allowed us to develop a June–July temperature reconstruction that explained 51.2% of the variance in the instrumental record. The reconstruction showed seven cold periods and five warm periods. Cold periods were identified from AD 1472 to 1524, 1599 to 1653, 1661 to 1715, 1732 to 1828, 1837 to 1847, 1865 to 1876 and 1907 to 1926. Warm intervals occurred from AD 1446 to 1471, 1525 to 1598, 1716 to 1731, 1848 to 1864, 1877 to 1906 and 1927 to present. The reconstruction agrees well with nearby tree-ring-based temperature reconstructions. Spatial correlation analyses suggest that our reconstructions provide information on June–July temperature variability for the southeastern Tibetan Plateau and its vicinity. Spectral analyses revealed significant peaks at 2–6, 10.7, 51.2, 102.2 and 204.8 yr. The temperature variability in this area may be affected by ENSO, the Pacific Decadal Oscillation and solar activity.